The Jardines del Rey (Gardens of the King) Archipelago lies just off the northern coast in the North of Cuba. Some of its cays are larger than some countries of the world, and its intact nature outstands making it one of the most precious spots in the Cuban Caribbean. 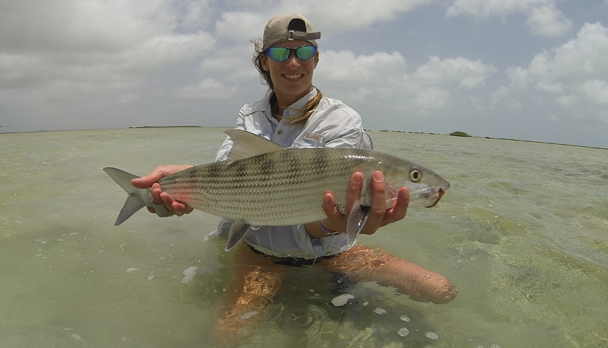 March through August has proved to be the best time of the year to fish bonefish, permit and tarpon. The Jardines del Rey (Gardens of the King) Archipelago lies just off the northern coast in the North of Cuba. Some of its cays are larger than some countries of the world, and its intact nature outstands making it one of the most precious spots in the Cuban Caribbean. To the north it is surrounded by a coral wall of about 248 miles long, which is the second largest barrier reef in the world, being the Great Barrier Reef in Australia the first. There are canals among the cays and islets, whose origin dates back to millions of years ago when they used to be ancient riverbeds. After the last big thawing, they were partly flooded when the level of sea water rose. The cays become bigger from the West to the East in Morón, Ciego de Avila Province. In this region Turiguanó Island and Cayo Coco, Guayabal and Sabinal are located, forming a kind of exterior coast in front of the shore, giving shape to the bays Buenavista, Los Perros and Jiguey. Among the formations in the archipelago, we can mention Cayo Coco which is linked to the mainland by a 11 mile causeway, which also links Cayo Guillermo and Cayo Paredón Grande. Other islets to be mentioned are Cayo Romano, Cayo Sabinal, Cayo Santa María, Cayo francés, among others. This northern area has developed an important nautical infrastructure for tourism. Anglers can stay in a 4-star hotel on the coast, which offers a customized service. Four boats 19 feet long with 60 HP Yamaha engines are provided, as well as well qualify fishing guides. The species that are fished in the area are up to 150-pound tarpon, bonefish, permit, jack crevalle, mouton snapper, cubera, spanish mackarel, barracuda, etc. 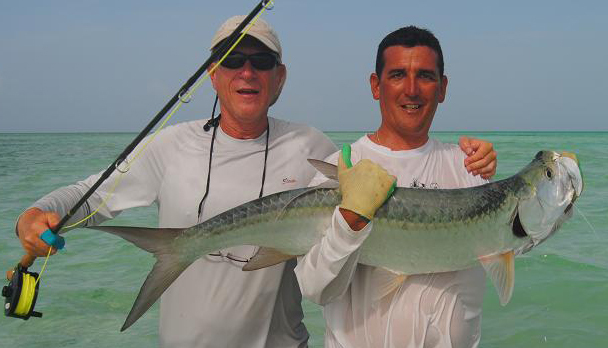 There is plenty of tarpon in the area from April through August, which is found in very clearly determined spots. There are many canals through which great numbers of tarpon come and go to the open sea, and where they are relatively easy to catch. There are also wide flat areas, of 3 to 6-feet deep, where they are easy to spot due to the crystal-clear waters. For bonefish, there are huge areas of flats and mangrove vegetation to be fished on boat or by wading. 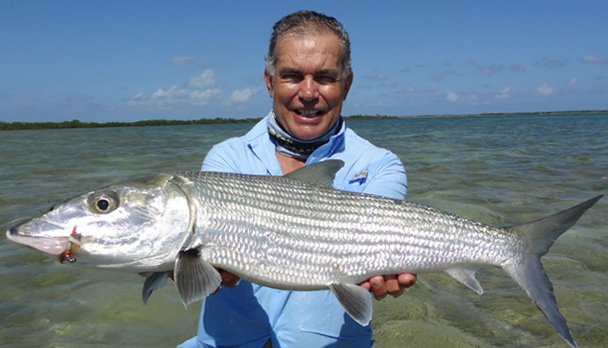 There are big-size bonefish with an average weight of 4 to 6 pounds, but some over 12 pounds have been caught. The region abounds in permit too, some of them weighing up to 40 pounds. The average weight ranges from 25 to 30 pounds. We suggest taking a #8 wt rod, two #10 wt rod and a #12 wt rod optional. At least a #8 wt rod and a #10 wt rod. Spare lines in case of possible cuts in the mangrove and reef areas. Intermediate and a sinking line for tarpon (300 to 450 grains). Flies for bonefish: Crazy Charly; Gotcha; Bonefish Special; Clowser Minow, Boogle Head, etc. Flies for Permit: Merkin´s Crab; Rag Head Crab; Nick´s Casablanca and others. Flies for Tarpon: Black Death; Purple Death; Toad Tarpon; Cockroach; Stu Apte; Seaducers; Sea Streamers, etc. Others: Leaders for bonefish (10 feet and 12-pound class tippet). 60 and 80 pound-test fluorocarbon shock tippet. 12, 20, 40, 60 pound fluorocarbon spools (tippet). Silicone to clean the lines. Steel line for Barracuda. Hook sharpener. Polarized sunglasses. Wading neoprene boots. Medicine for headaches, stomach and others. Sun block. Lightweight rain jacket. Insect repellent. Rates include: Transfer to Marina, 1 fishing day, beverages, bilingual guide, boat and fishing license. Rates do not include: Lunch, fishing equipment and flies, guide gratuity adn health insurance. Notes: We can arrange accommodation. A cold front brought very bad weather to the area with rains and rough sea. The fishing was difficult though some good tarpon were caught. We had a good time in Cuba, especially the fishing. About permit, I got mine! Attached is the picture, for me the crown on a fly fisherman's work. It was a day with bad weather, many clouds so the site was bad, some rain and a lot of wind. During the day we got to see 5 permit, some of them we couldn't even get close to have a shot at them, but in the afternoon we got two changes and one of them was a hit. A very good day! Concerning tarpon, it was the first time I was fishing for them with a #11 wt fly rod. I fished a nice tarpon, see picture attached. I also hooked a very big one, estimated by the guide around 150 lbs! I couldn't land it though, but the guide counted it as a catch since the leader touched the rod. Anyways, as it was very big we had to go to shallow waters in order to properly land it. At the very end while the guides were trying to manage the tarpon, the 110 lbs tippet broke... Man that tarpon was a good work out for over one hour! Another day with the wind blowing 6 beaufort we were on open sea by the beach and again a big tarpon was hooked, around 70 lb. The guide told me that it was a male because when it got hooked, it ran off immediately, opposite to the big previous one I lost. 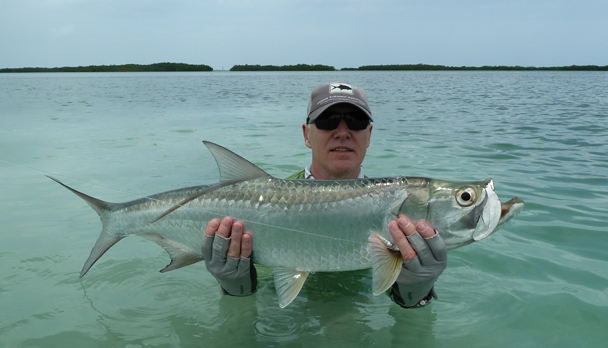 After a good fight, once in the guide's arms, the tarpon managed to escape... no picture, but a good fight memory. We also saw and hooked about 4 other tarpon but the line broke or/and I missed the fish. I also learned that day form the guide, how to cast for long distance shoots with #12 wt flyline in two strokes againit the wind force 6 to 7 beaufort in open sea. It was great experience on it self and hard work! Finally I got 20 average bonefish. 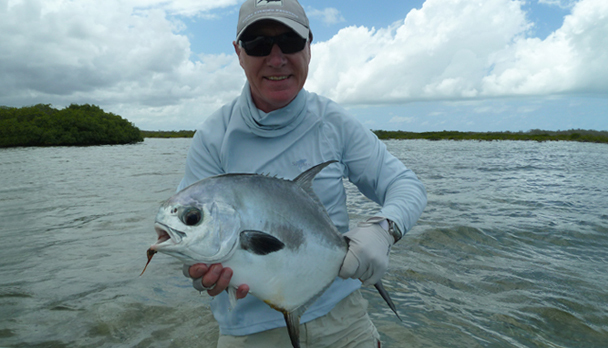 I think because of the weather the days were better for permit and tarpon. About the fishing I can say the weather was not optimal but the guides were very good, they have a great knowledge of the area and share their passion for fly fishing! !